Hundreds attend the Baneshwar Fair, an important festival in India, taking place in Dungarpur, Rajasthan. This festival is an integrated culture of the place. This fair is organized partly by the tribal community in the state. It reflects their customs and traditions. The fair revolves around many rituals and bears a religious significance. The name "Baneshwar" came from the "shivlinga" of the Mahadev Temple in the region where the fair takes place presently. The tribes called "Bhils" celebrate the festival with pomp and show. Beneshwar Fair is a five days fair starting from Shukla ekadeshi of Magh month of Hindu calendar. This is the unique and biggest tribal fair of the country attracting lakhs of devotees. This fair is annually held in Dungarpur, Rajasthan. The name Beneshwar is derived from the holy Shiva Linga located in the Shiv temple in Dungarpur. 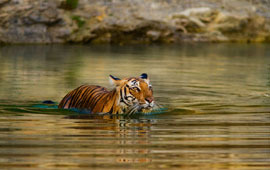 ‘Beneshwar’ in the local language (Vagdi) means ‘master of delta. The fair is organized at delta shaped by rivers Mahi and Som. The fair continues until Shukla Purnima of ‘Magh’ month. The Beneshwar fair is in fact the combination of two fairs. One fair is organized to pay tribute to the Lord Shiva, known as Beneshwar Mahadev. Another fair is held to celebrate the finish of the construction work of the Vishnu temple by Jankunwar, the daughter-in-law of saint Mavji. The priest or Mathadish arrives in a massive procession to the fair site from Sabha and take a dip into the river water. Then aarti of the Mathadish are performed and Raslila are renovated during the night in the Lakshmi Narayana temple. 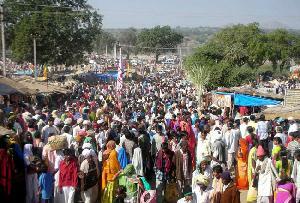 Bhils or tribal people from Dungarpur, Udaipur and Banswara constitute the major part of the gathering. The fair is very famous and is organized at very large level.